Avocados – most definitely one of my food obsessions. I have missed them so! I really didn’t eat much of them this winter. Confession: I am a cheapskate about heating and cooling costs. The baseline temperature on my thermostat was absurdly low this winter – 63 degrees! – a fact many people who know me find astonishing given my love of heat (I’m that girl who sits in full-blown 90-degree sun at a baseball game, sweat dripping off of me and perfectly happy). My key to keeping toasty in a colder clime? A lot of layers – I’m talking robe over second robe over pajamas layers. But avocados don’t really have the ability to layer, or even to wear a light sweater, so my house was not an optimal environment for their ripening this winter (I tried – they weren’t having it). So I’m excited that the weather where I live in Michigan has gotten generally warmer in the last month; I say generally because we went from the low 80s to the low 50s in the span of a day this weekend! But overall, it’s been optimal avocado-ripening weather lately, and I had a batch of good ones, so I was inspired to feature them in this cold quinoa salad. There are few things better in life than a perfectly buttery, melt-in-your-mouth avocado! Add the other fresh ingredients – the sharp onion, the vibrant cilantro, the crisp orange bell pepper – and a delightfully flavorful yet still light and healthful dish that won’t weigh you down poolside emerges. Rinse quinoa and cook according to package instructions (for me, that meant bringing the one cup of quinoa in two cups of water to a boil, then covering it, reducing the heat to a simmer, and boiling for 10 minutes). When ready, transfer it to a large mixing bowl and let cool. Once it’s fairly cooled, add the other ingredients and toss well. Serve chilled, garnished with slices from the additional avocado. Yields three good-sized servings. Such a beautiful summer salad! 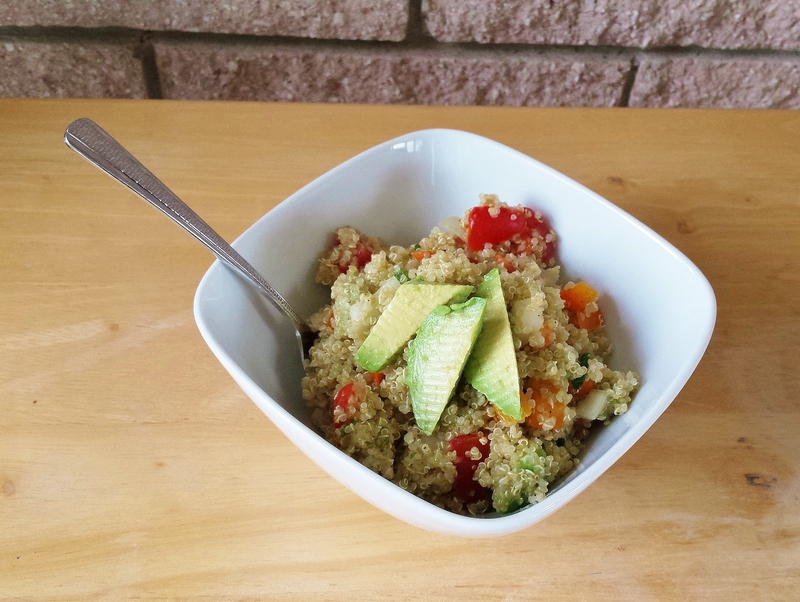 It reminds me of taboulé which I have a lot during summer, but the quinoa and avocado give it such a nice twist. Delicious! Thank you, Sabine! I just visited and am now following your site – you have such gorgeous photos!